The Vancouver Canucks are in as unenviable a position as a franchise can reside. They’re slowly doing something that resembles rebuilding and trying to remain competitive in the interim. They’re serving two masters with one foot stuck in the quagmire of today and the other not far removed. That modus operandi hasn’t served the Canucks well under Jim Benning. They’ve won two playoff games in his first two seasons and aren’t any closer to finding a succession plan for the Sedin twins. They just haven’t had enough picks to get lucky, and the picks they’ve kept haven’t exactly been in premier positions. To the Canucks’ credit, they’ve generally drafted well enough, too. Their system is as deep as it’s been in over a decade, even if it lacks game breaking talent. With that in mind, let’s take a look at what they do have. If there’s one thing Vancouver’s system isn’t short on its depth. I could see any number of these players developing into long-term fits in the Canucks bottom six. In a way, though, that’s kind of the problem. Who among these players is replacing Daniel or Henrik Sedin when they’ve either left the Canucks, the league or the realm of respectability as first line contributors? The crown jewel of the Canucks’ pool is obviously Brock Boeser, taken 23rd overall in the 2015 NHL Entry Draft. 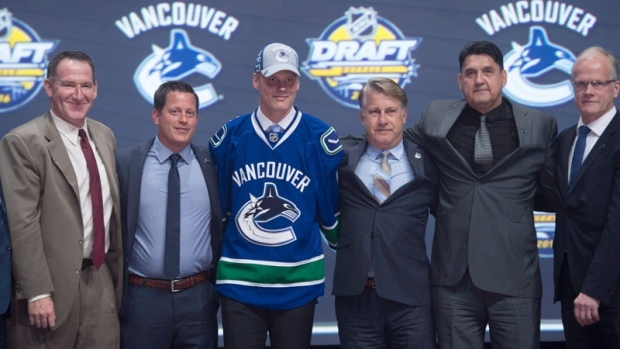 That selection wasn’t met with much in the way of fanfare, but true to form, it appears as though Benning, a master scout by trade, outsmarted the system. When viewed through the lens of most readily available draft analytics models, Boeser would go in the top ten if that draft were done over again. I took some time before deciding whether to include Anton Rodin among this group. He’s eligible for the Calder Trophy, so I figured it made some level of sense; even if he is 25-years-old. Among this group, Rodin has the potential to make the largest impact as soon as next season. Assuming the Canucks’ lineup remains constant, he’s currently slated to play in their top six. The opportunity is there. Regarding long-term projects, the Canucks have a pair of centers in Dmitry Zhukenov and Adam Gaudette that showed very well in their draft+1 seasons and flashed potential as middle-six options somewhere down the road. Both are slight of stature, so the odds will always be stacked against them. But they have a mature enough game that it’s not inconceivable that they one day break through. Though much of the talk in Vancouver centred on their replete depth of defencemen in their prospect pool, they appear, at first glance, to be loaded at the position. Particularly on the left-side, which really isn’t anything new anywhere. Among the Canucks’ blue liners, Olli Juolevi (taken fifth overall in the 2016 Draft) likely has the highest ceiling. That said, Juolevi is still two, or maybe even three years away from making the jump to the NHL. The hope is that he’ll be worth the wait. Nikita Tryamkin flashed potential playing big minutes for the Canucks down the stretch. Much of that was injury-related, though. It looks much more likely that Tryamkin will start the season as the Canucks seventh defenceman, which is fine given his age and experience at the NHL level. Overall, the Canucks have invested heavily in their blue line, and it shows. Beyond Juolevi it’s hard to imagine any of these players developing into a first pair defender, but for Tate Olson, Jordan Subban and Guillaume Brisebois, I don’t think a top four role is outside the realm of possibility. The Canucks haven’t a wealth of goaltenders in their prospect pool, but they’ve certainly got some quality building blocks. Taken 36th overall in the 2014 NHL Draft, Demko projects as an elite starting goalie and doesn’t appear far off from getting there, assuming his trajectory remains relatively constant.